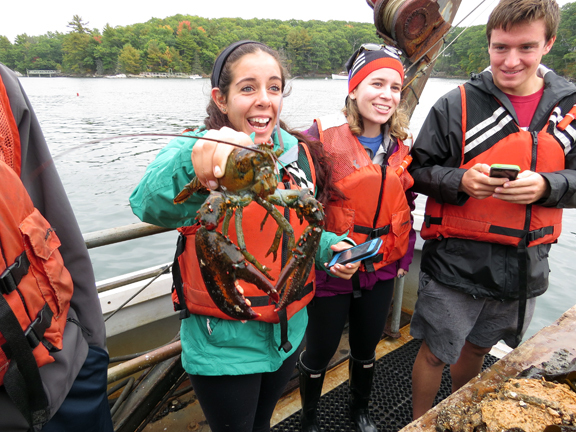 Students in Invertebrate Zoology (Bio 211) got a first hand exposure to dredge sampling for benthic invertebrates in Fall 2014. The learning goals articulated below provide our students a framework for contextualizing and learning the fundamental knowledge needed to complete the biology major and to become prepared for future work in the discipline. be able to compare and contrast features of living organisms, acknowledging common origins and evolutionary differences. understand and apply ethical standards when undertaking scientific research. apply fundamental biological concepts to novel scenarios. examine the ethical dimensions of biological issues. With gratitude, we acknowledge that these learning goals were adapted and modified from a similar set of learning goals articulated by the Biology Department at Trinity College.